As the lights go out in a recent concert, a K-pop singer PSY takes the stage singing his global hit Gangnam Style while doing his trademark dance amid dancers disguised as the Chinese Emperor Qin’s terracotta soldiers and space aliens. This was followed by performances of popular K-pop groups, Big Bang and 2NE1, who sang some of their hit songs. The description of these energetic performances created by internationally famous K-pop stars may seem real but has a secret behind them; all of the performers are made in holograms. K-live, located in Lotte FITIN Dongdaemun, is the world’s first K-pop hologram concert hall. K-pop stars such as PSY, 2NE1 and Big Bang appear to perform using hologram technology. That is, the K-pop stars are virtual images. There has been a growing demand for three- dimensional(3D) videos and images such as those seen in K-live. To meet these demands, holograms have become the method whereby images are projected in the air to create a sense of reality. From Greek, hologram is a compound word meaning “the whole picture.” It is formed from the words “holo,” meaning the whole, and “gram,” which means messages or information. A hologram takes the form of a 3D object. As two lasers encounter each other and overlap, wave fronts can be bigger or smaller. This phenomenon is used for the hologram technology in the form of a new image transfer method that records and plays cubic information. Since a hologram shows all dimensions of an object, this technology can be applied in 3D videos. As user experience is being more focused upon, the importance of hologram is increasing. User experience refers to all encompassing experiences in which people use a number of various systems, products and services both directly and indirectly to heighten their viewing pleasure. When people use goods, they often have particular habits, using those items and assigning certain emotions about those goods. For example, when people use the touch scroll function on smartphones, they can draw the screen aside to view a next page as they read paper books. This is part of the user experience. A hologram can become a type of goods that people can control or manipulate in ways they desire in the future. Holograms can be divided into analog holograms and digital holograms but it is the latter that can visually represent an object perfectly. Thus, since this type of hologram presents all dimensions of an image, it is expected to be a key commercial technology in the future. A recent example of a hologram used on a commercial scale is K-live, connected to K-pop. However, K-live, which delivers a 3D performance to an audience, is not actually a digital hologram but a pseudo hologram or floating hologram. It works in the way images are projected on the floor with a beam projector. If the images on the floor are reflected onto a transparent screen called a foil inclined to 45 degrees, the projected image on the screen will appear as a hologram. A genuine hologram can also be used in certain industrial fields unfamiliar to the public. For instance, a medical hologram machine which projects images of organs that are hard to examine is used. This is also a device known as a radio- holographic computer, HoloLens, which projects a user’s hologram. The company RealView also offers a 3D hologram by using existing medical imaging such as computerized tomography and magnetic resonance imaging. 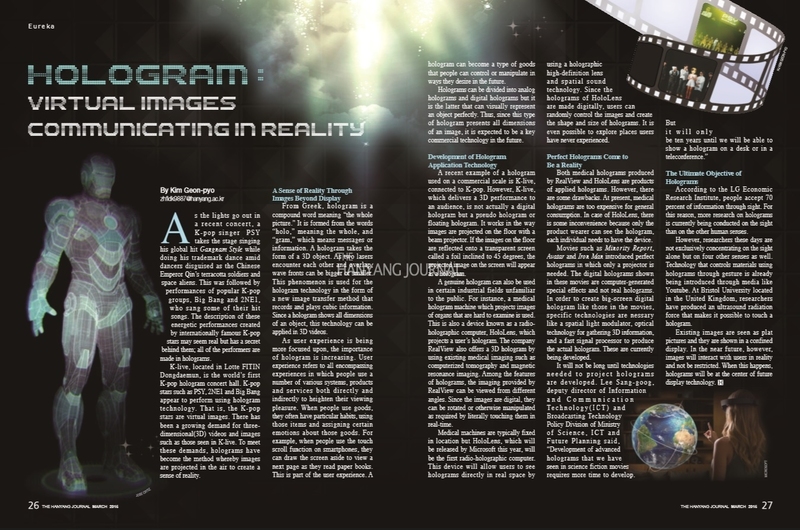 Among the features of holograms, the imaging provided by RealView can be viewed from different angles. Since the images are digital, they can be rotated or otherwise manipulated as required by literally touching them in real-time. Medical machines are typically fixed in location but HoloLens, which will be released by Microsoft this year, will be the first radio-holographic computer. This device will allow users to see holograms directly in real space by using a holographic high-definition lens and spatial sound technology. Since the holograms of HoloLens are made digitally, users can randomly control the images and create the shape and size of holograms. It is even possible to explore places users have never experienced. Both medical holograms produced by RealView and HoloLens are products of applied holograms. However, there are some drawbacks. At present, medical holograms are too expensive for general consumption. In case of HoloLens, there is some inconvenience because only the product wearer can see the hologram, each individual needs to have the device. Movies such as Minority Report, Avatar and Iron Man introduced perfect holograms in which only a projector is needed. The digital holograms shown in these movies are computer-generated special effects and not real holograms. In order to create big-screen digital hologram like those in the movies, specific technologies are nessary like a spatial light modulator, optical technology for gathering 3D information, and a fast signal processor to produce the actual hologram. These are currently being developed. According to the LG Economic Research Institute, people accept 70 percent of information through sight. For this reason, more research on holograms is currently being conducted on the sight than on the other human senses. However, researchers these days are not exclusively concentrating on the sight alone but on four other senses as well. Technology that controls materials using holograms through gesture is already being introduced through media like Youtube. At Bristol University located in the United Kingdom, researchers have produced an ultrasound radiation force that makes it possible to touch a hologram. Existing images are seen as plat pictures and they are shown in a confined display. In the near future, however, images will interact with users in reality and not be restricted. When this happens, holograms will be at the center of future display technology.